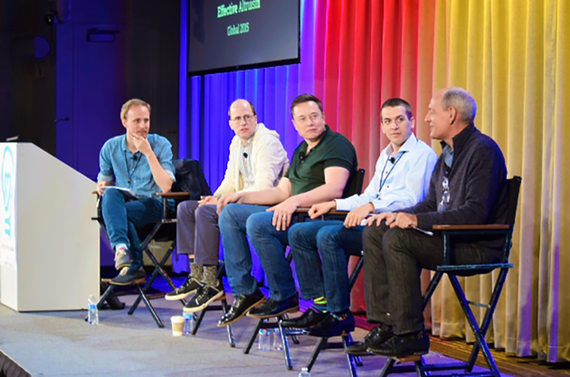 Elon Musk, Superintelligence, and Maximizing Social Good: A Weekend at History's Largest Gathering of "Effective Altruists"
From July 31st to August 2nd, the Google Quad campus in Silicon Valley was overtaken by a motley crowd of over 400 entrepreneurs, academics, technologists, and activists, all attendees of the Effective Altruism (EA) Global conference. They came from across the world to hear from speakers such as Tesla and SpaceX CEO Elon Musk and Google.org director Jacquelline Fuller and to discuss the most effective ways to positively impact the world. There are three EA Global events held this year at three different locations - EA Global Oxford and Melbourne will take place later in August with around 300 and 100 participants respectively. 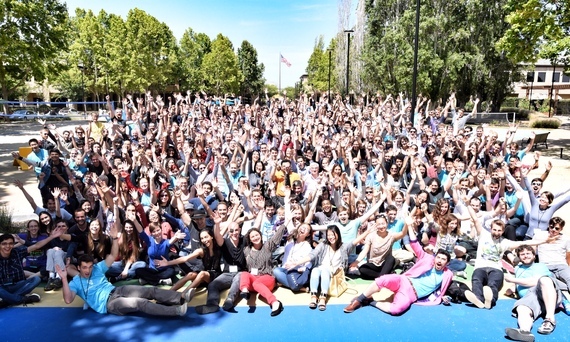 Over 800 applied to EA Global Google HQ, marking a radical expansion from the inaugural "2013 Summit," where 60 participants gathered in a house in California, and a testament to the exponential growth the EA movement has recently enjoyed. EA organizations, local EA chapters, and EA student groups dedicated to using "reason and evidence to take on the world's greatest challenges" have proliferated in the last few years. "It has spread all around the world," William MacAskill, keynote speaker and co-founder of EA organizations Giving What We Can (GWWC) and 80,000 Hours, said in an interview. The three-day gathering, a project by the Centre for Effective Altruism, featured a variety of event formats on a broad range of EA-related causes, topics, and skills. There were talks on topics like global poverty, animal advocacy, cause prioritization research, and policy change. There were also workshops on choosing careers to maximize social good, Q&A sessions on life as an EA, ignite talks by high-impact charities and charity evaluators, and panels on running EA chapters, among many others. EA Global president Tyler Alterman said in an interview that holding the conference was important because in person communication affords "much higher bandwidth" and social returns than virtual networking. "It is much easier to share ideas, change your mind, meet people you want to recruit, and find funders in person," he said. MacAskill, who recently authored Doing Good Better, added that the international nature of the conference "helps to ensure that EA is a global unified network," easing coordination across disparate groups, the sharing of resources and personnel, and the dissemination of ideas, which tend to vary geographically. For example, a focus on animal rights branched out from Switzerland, and an emphasis on rationality and global catastrophic risk spread from the Bay Area. About 20% of the participants at the Google conference came from outside of the United States. The attendees, admitted through a selective application process that sought traits like critical thinking skills, were deliberately diverse in other ways as well. Organizers chose an equal mix of people who have been involved with EA for a while and are core to the community, people who are fairly affiliated but not as involved, and people who are new to or curious about the movement. Rune T. Kvist, a rising sophomore in Philosophy, Politics, and Economics at Oxford University, is a newcomer to the EA scene. He said he discovered EA a month ago and he has gained much from his experience at EA Global. "All the people here are incredibly brilliant and into their fields and happy to communicate about them. People are very generous with their advice, thoughts, and criticism." In particular, Kvist said that the conference was "a great place to learn what is needed and how to get started" in EA entrepreneurship, his field of interest. "Being in a community with shared values [...] makes for powerful connections between people," he said. Newly-settled EA Angelica Carrilo of Peru has belonged to the movement for under a year. Since reading research by 80,000 Hours, which provides EAs with career guidance, she has been earning to give away 10% of her income to charity. "It's been amazing. Everyone is very friendly and we are all here because we want to make the world a better place," she said of the conference. "My goal is to make connections but also look at how this could be replicable for other areas in the world." She has Latin America in mind - Carrilo is working with three others in Peru to develop a site to provide EA content in Spanish - but chuckled, "I would like to see whole world be EA!" Meanwhile, Joey Savoie has identified as an EA since 2011. He organizes EA meet-ups in Vancouver, is vegan, donates everything he earns above $10,000 per year, and is working at an EA organization he co-founded called Charity Science, which does outreach and fundraising for high-impact charities recommended by charity evaluator GiveWell. He said he was surprised by the large proportion of attendees who were new to EA and thought it was a valuable experience for them but personally hoped to see a higher composition of people who were already deeply enthused by the movement. "Maybe it makes sense to do two similar events - introductory and more advanced stuff," he propositioned. Savoie said he was excited to be at the conference to find staff for his organization, to meet people he had heard a lot about online, and to build morale in the community. "I think it's important for likeminded people to meet up to motivationally inspire each other," he said. 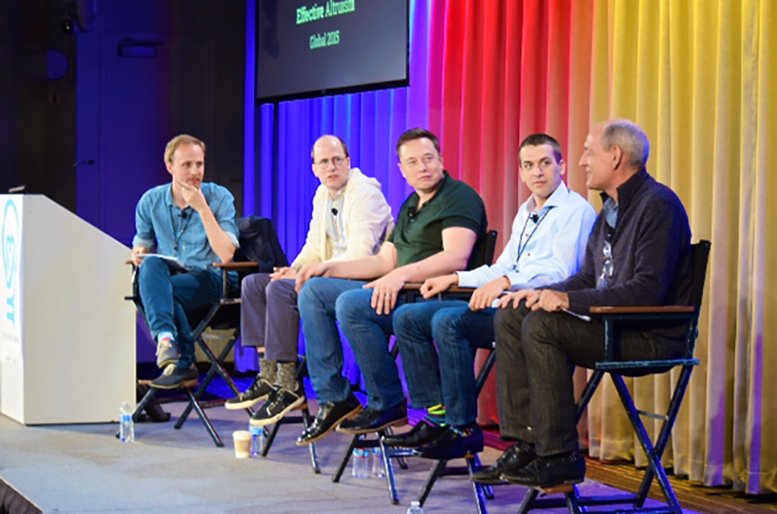 The centerpiece event was a moderated panel on the topic of artificial intelligence (AI) safety featuring Elon Musk and three AI experts. This topic is germane to EA because there are concerns that machine intelligence development could lead to the eventual creation of a "superintelligence" - an AI with higher capability than humans in a general sense - that may threaten the existence of humanity if its programmed goals and value systems are not properly aligned with those of humans. Researching AI safety and strategy to try to alleviate this potentially catastrophic risk may therefore have the potential to do an extraordinarily large amount of good, even if the actual chance of catastrophe is low. "The AI researchers are all racing toward creating [superintelligence] without wondering what's going to happen if they succeed," said Musk, who in January 2015 donated $10 million toward funding research in an attempt to steer the technology toward a trajectory that avoids human harm. "I think AI risk is the biggest [existential] risk that I can see today by a fairly significant margin and it's happening fast - much faster than people realized," he said, adding that "consequences could be dire." Stuart Russell, an eminent Berkeley AI researcher who has studied the topic for the past thirteen years, concluded the panel by saying that just as medicine is practiced to heal patients, AI research should intrinsically signify "building intelligent systems that benefit the human race" rather than "building smart machines." Despite all the anticipation surrounding Musk's appearance at the conference, what the participants were most thrilled about was each other. The atmosphere was transfixed with excitement and joviality throughout the weekend. Talks and workshops would frequently break out into cheers or roars of laughter. Hands wildly gesticulating, participants took advantage of breaks to engage in enthused discussion with old and new friends, with many skipping talks to be able to spend more time enjoying each other's company and striking project collaborations. Perhaps it's impossible to fully convey the magic in the air without a personal account. To begin with, there were so many objectively fascinating people. I walked toward dinner with a friend of a friend who had worked at eight jobs in the past four years that included gigs as a street musician and at a quantitative hedge fund. As I stood in line to grab food I met a man from Switzerland who is working at an organization that successfully encourages poker players to donate 2% of their winnings to charity. I then sat down to dinner with a life-extension researcher at Johns Hopkins who takes 150 pills a day to prolong his longevity and views anti-aging research as "perhaps the most altruistic cause" and critical for avoiding global economic collapse. I had the opportunity to hear from frontrunners of the EA movement like Holden Karnofsky, co-founder of GiveWell and lead of its focus-area-broadening Open Philanthropy Project, and seek advice from representatives of EA organizations like the Future of Humanity Institute. I also got to meet Tim Urban, author of one of my favorite blogs, Wait But Why, and Eliezer S. Yudkowsky, who co-founded the Machine Intelligence Research Institute as one of the first advocates for Friendly AI and penned Harry Potter and the Methods of Rationality, a fan fiction that has been wildly popular within the LessWrong rationalist community. It was elating to be surrounded by a crowd that cared just as much about the causes I obsessed about and who had thought about interesting issues more deeply than I did. It was almost unbelievable but every single random person I bumped into would turn out to be a wealth of knowledge and a delight to know. Moreover, people eagerly offered each other help as if they cared about advancing each other's careers as much as they did their own; the sentiment was that if I help you achieve your goals, I help achieve mine as well, because our goals are aligned. If you plucked any of these people from the conference and placed them in my normal life I would have thought I'd discovered a gem - the sort of kindred spirit you'd talk to nonstop for hours at your first encounter. I was in the midst of hundreds of such people - it was marvelous and overwhelming. At one dizzying moment of felicity, I stepped back to soak in the cafeteria din, which seemed the most exhilarating and reassuring sound I have ever heard. It was the feeling of finally arriving at home, what Jacquelline Fuller tried to articulate to "this [...] group of people who not only want to do good but who want to bring their best to the table" when she made the opening remarks, "Good morning, this is my tribe." In her keynote, Fuller discussed how Google.org, the philanthropic arm of Google, practices the data-driven and evidence-based-approach of effective altruism to increase its impact. She cited how using Google Earth technology to track thatched roof huts as a proxy for poverty helped Google.org "deliver 90 cents of every dollar directly into the hands of the poor" in its partnership with GiveDirectly, a charity with one of the highest GiveWell effectiveness ratings; and how developing remote sensor technology with charity: water to determine which wells in the developing world were actually functioning enabled it to "shift dollars and attention" to the most reliable partners on the ground. In his closing keynote MacAskill said that EA has "enormous potential to make huge progress on some of the biggest, most neglected and most tractable problems in the world." It would undoubtfully be great if this were true, and perhaps EAs can succeed where others cannot. After all, EAs are driven to not only think about doing good but to actually turn their intentions into real actions, as reflected in the motto of the conference, "Figure out what to do ... and do it!" MacAskill pointed out that for years, philosophers at Oxford discussed the moral imperative to give a substantial amount of their money to the poor, but he never actually saw such giving take place until he met his future GWWC co-founder Toby Ord, who donated 60% of his salary at the time. EA's principle of cause neutrality may also give it an important edge in facilitating what Alterman described as "radical collaboration not seen in any other community." That EAs seek to net the highest impact, instead of being intrinsically attached to particular causes, means that EAs working in different focus areas and across national boundaries are all motivated to help each other reach their common goal of maximally benefiting the world. For the time being though, EA still holds a minor corner in the grand sphere of total influence. The movement moved $28 million to GiveWell-recommended charities in 2014 and, as of the beginning of 2015, GWWC has received about $380 million in lifetime pledges since its inception in 2009. These funds are impressive but orders of magnitude below the size of economic stimulus packages like the American Recovery and Reinvestment Act, whose $831 billion afforded only temporary effects on the economy. Even in the philanthropy sector, EA is relatively insignificant - American individuals alone donated $250 billion in 2014. The prospect of quick growth may seem a promising fix, but EA faces challenges in the form of collapse due to internal causes and large forces that seek to do good in competing ways. For instance, cheap energy and anti-aging are high priority causes for Y Combinator President Sam Altman and PayPal and Palantir co-founder Peter Thiel respectively, but these issues are far off mainstream EA's radar. With these concerns in mind, it is safe to say that it is still unclear whether EA has the capacity to realize its great ambitions. But if the excitement at EA Global is any indicator, the difficulty of the task isn't stopping EAs from pursuing impact the way they know best - trying to do as much good as they possibly can. Thanks to Vipul Naik and Issa Rice for comments and suggestions on drafts of this post. Thanks to Lauryn Vaughan and Alton Sun for photo credits. All responsibility for the final version is mine.